Went to check out the 2011 FTC kickoff (Robotics) event earlier this month at Monrovia High School. Several teams brought last year's robots to demonstrate out on the course. It was quite interesting to watch these robots, controlled wirelessly, try to pick up handballs or push a bowling ball up a ramp. 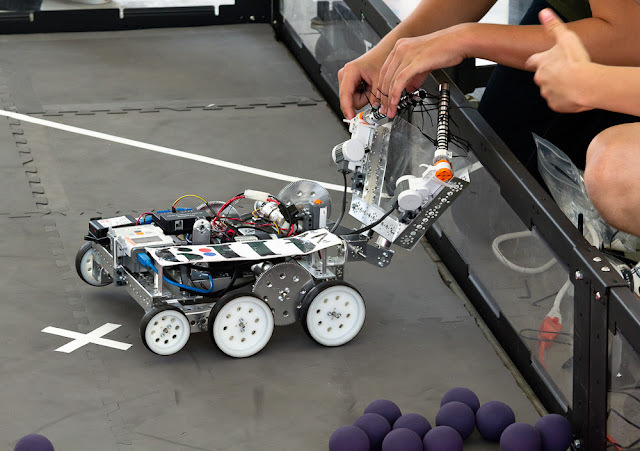 The next robotics event will be the 1st Annual Halloween Robotics Scrimmage on October 29, 2011 at the Monrovia High School Event Center. It will be held from 8am to 1pm and is open to the public. These are some very intelligent and talented kids. Come on out and support the Monrovia High School Robotics Team. Robotics Event - Saturday, December 10th - Monrovia High School. 845 W. Colorado Blvd. First Tech Challenge. LA Championship Tournament.